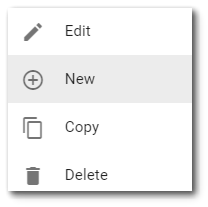 Select the More Options icon on the right-side of the dashboard header to open a drop-down menu. Click the New button within the dashboard properties to create a new dashboard. Note: The New button is only available if the user has Creator permission for dashboards. The new dashboard will be based on a template setup in the database and identified by SDT_DASHBOARD.USER_ID = -1 and SDT_DASHBOARD.URL = "~/newdashboard". If this record is not present, then the current dashboard will be copied. When a new dashboard is created, two sections with two columns each will automatically be generated. Two empty HTML widgets will also appear on the dashboard, one in each section. The default sections and widgets are intended to be placeholders. The new dashboard will have a default title that includes the user name and date. New dashboards will require customization. Use the Dashboard Chooser to select the dashboard to be duplicated. 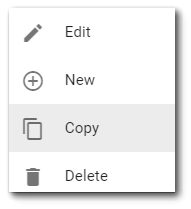 Select the More Options icon on the right-side of the dashboard header to open a drop-down menu. Click the Copy button within the dashboard properties to create a copy of the current dashboard. The new dashboard will have the same title as the copied dashboard, but with the user name and date appended. 1.Load or refresh the dashboard page in a browser, so the address reflects the dashboard number (e.g., https://enterprise.somwhereonline.com/default.aspx?d=8733). 2.Note the dashboard number. In the example above, the dashboard number is "8733". 3.Edit the address by appending the following to the URL: /api/download/dashboard/[dashboard_id] (e.g., https://enterprise.somwhereonline.com/api/download/dashboard/8733). 4.Select the Enter key to download a ".dashboard" file. 5.The dashboard can now be re-deployed to the same database or another database using one of the following methods. Note that the Module Manager Widget can only be accessed by users assigned to the Administrator role. •Save the dashboard download in the Enterprise deploy folder, typically at C:\Program Files\EarthSoft\EQuIS\Enterprise7\deploy. •Load the deploy site (e.g., https://enterprise.somwhereonline.com/default.aspx?action=deploy) and login to deploy the new dashboard(s). •Navigate to a dashboard that currently contains the Module Manager Widget or add the Module Manager Widget to a dashboard. •Drag the ".dashboard" file into the Drag and Drop section of the Module Manager Widget. Select Upload. •If the ".dashboard" file uploaded successfully, the file will appear at the top of the Module Manager grid. •Navigate to the Dashboard Chooser and select the newly deployed dashboard. Note: References to user reports will not transfer due to the unique user and ID references between databases. These dashboard components will require manual updates. Downloaded dashboards do not get removed from the database.